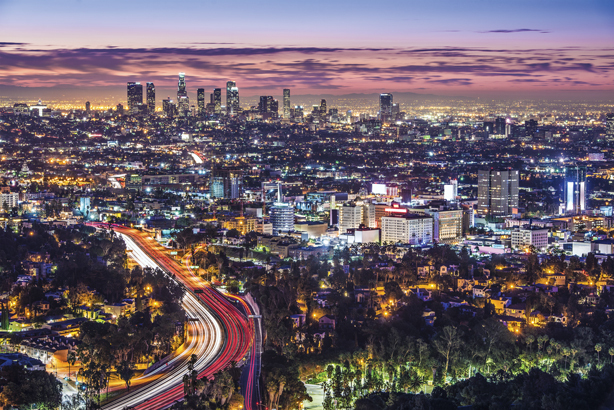 Jill Calcaterra, CMO, Cinedigm, details how the city's entertainment scene makes LA a highly energetic, but competitive, marketplace for PR pros. Los Angeles is often perceived as laidback with lots of sunshine and surfing, while New York City is hustling and bustling with high energy, but Jill Calcaterra, CMO of Cinedigm, says that is actually not the case. "In our Los Angeles office, things are always moving quickly. The environment around here is highly energetic," she says. "I’m in the entertainment space, so there are always new releases, stories, and exciting things to deal with." One label about the West Coast city that Calcaterra says is accurate is that the entertainment industry reigns supreme. 1. The renowned Hollywood sign, situated on Mount Lee, which was built in 1923, originally said Hollywoodland. 2. In 2013, a record 42.2 million visitors went to LA, and spent $18.4 billion on local businesses. The LA tourism industry also created 21,400 new jobs last year, bringing the number of jobs supported by tourism in the area to 436,700, according to DiscoverLosAngeles.com. 3. More than 10 million people live in Los Angeles County out of California’s total population of about 38.3 million, according to the 2013 US Census. 4. In LA, the creative sector supported one in seven jobs with a net economic output of 10.4% of the region’s gross total, according to the 2013 Otis report. 5. Some of the largest companies based in Los Angeles include The Walt Disney Co., Dole Food, AECOM, Occidental Petroleum, DirecTV, and Mattel. 6. For a "fun and trendy" lunch meeting, Calcaterra suggests going to Hinoki & The Bird. While that sector makes up a large chunk of the business landscape, including PR and marketing jobs, she says gaming and new media, particularly multichannel networks, are gaining traction. For example, Machinima and Maker Studios are companies that build on YouTube’s platform using video capabilities. "These networks add a huge amount of energy because that area is exploding and it’s such an unknown territory, so it’s constantly changing, evolving, and presenting new opportunities," explains Calcaterra. Cinedigm, a digital entertainment distribution company, has also gained PR opportunities from the networks, with the business now able to weave entertainment properties into online shows such as Funny or Die. When it comes to media outreach, Calcaterra says the market has many print, online, and broadcast outlets, such as the Los Angeles Times, The Orange County Register, Yahoo, and LA-based late-night shows, such as Jimmy Kimmel Live. Calcaterra notes that celebrity brand ambassadors are major parts of marketing campaigns, but because "there are so many celebrities of varying degrees of interest to the media, it is getting harder to place them unless they are absolutely top tier." For PR and marketing pros not in the entertainment space, she adds that the hospitality and banking segments are popular. Recruiting is relatively easy, with the University of California, Los Angeles and University of Southern California nearby. Calcaterra adds that even aspiring filmmakers and directors, who understand how the PR side of the business works, apply for roles, along with people who have a traditional communications and marketing background. "We have more applicants than we have jobs," making it a competitive market, she adds. Despite LA’s transportation problems, Calcaterra says it is an "exciting place" to be. "The people are nice, generally open-minded, and always looking to try new things. That’s something that serves us well in this changing landscape," she adds. "You always need to be looking for new ways to promote and market your properties."